Nuclear Blast Records has officially opened pre-orders for its new live recording. Nuclear Blast Records announced Friday that pre-orders for Symphonic Terror have opened. The album is currently scheduled to be released Nov. 23 via Nuclear Blast Records on seven separate platforms noted below. The two-hour, 23-song performance was originally recorded Aug. 3, 2017 at the Wacken Open Air Festival in front of an audience of 80,000 people. Thousands more streamed the performance online live. The second section features a rock/symphonic performance of select songs from Wolf Hoffman’s recent solo album Headbanger’s Symphony. The songs featured in that record are amped up takes on some of the world’s most beloved classical compositions from famed composers Beethoven, Mozart, Vivaldi and others. The concert’s third segment features the band performing many of its own hits, such as ‘Princess of the Dawn,’ ‘Breaker,’ ‘Fast as a Shark,’ ‘Metal Heart,’ ‘Stalingrad,’ ‘Shadow Soldiers,’ ‘Teutonic Terror’ and ‘Balls to the Wall’ complete with orchestral backing. The concert’s full track listing is noted below. 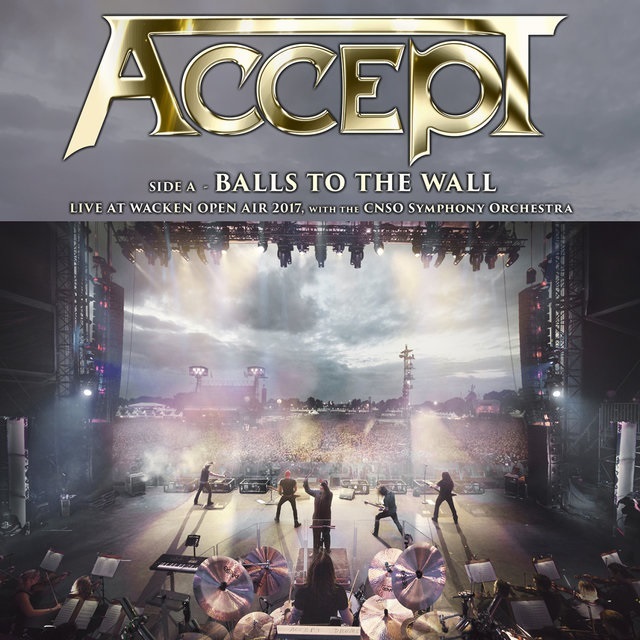 In anticipation of Symphonic Terror‘s release, Accept will release a limited edition 10-inch vinyl pressing of ‘Balls to the Wall/Symphony No. 40 in G Minor’ on Oct. 5. Both performances are taken from Symphonic Terror. Digital and physical Pre-orders for the vinyl are also open now. Also in anticipation of Symphonic Terror‘s forthcoming release, the band is touring worldwide, including the current U.S. leg of its tour. The band is scheduled to perform live in St. Charles, IL on Sept. 26. The U.S. leg of its tour is scheduled to wrap Oct. 4 in Houston, TX. Once it wraps the U.S. leg of its tour, Accept will move to Central and South America from Oct. 6 to Oct. 25 before back to Europe from Nov. 1 to Nov. 4 for what has been dubbed “The Rise of Chaos Festivals 2018 Tour.” Orden Ogen, Monuments and Refuge will join Accept for the festival shows. 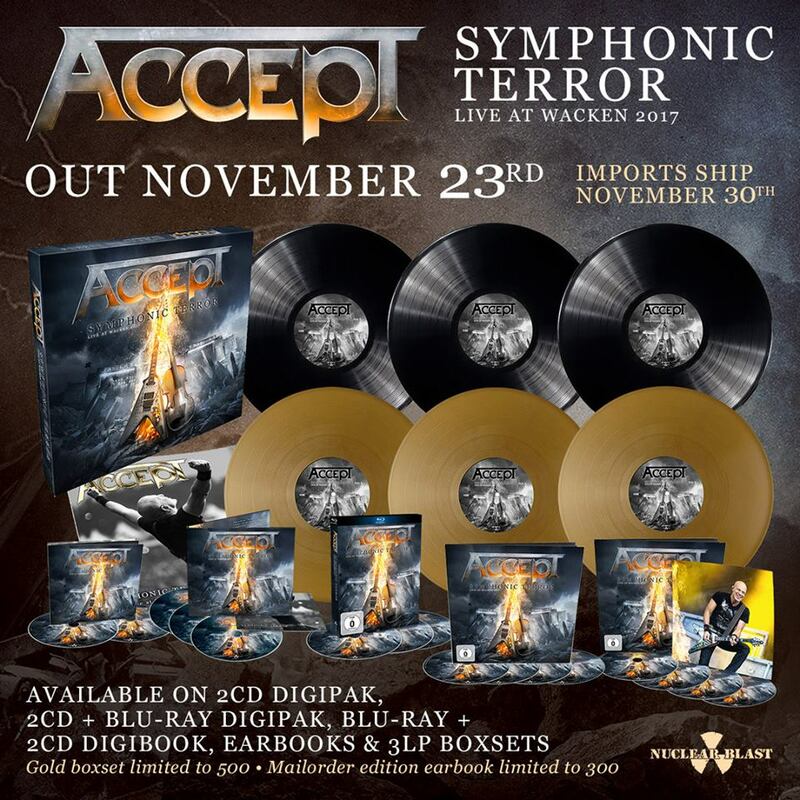 Accept will release its new live recording Symphonic Terror — Live at Wacken 2017 late this fall,and in anticipation of its release, the band has announced it will release a special limited edition vinyl single featuring two performances from that recording. The special 10-inch vinyl single ‘Balls To The Walls / Symphony No. 40 in G Minor’ is currently scheduled to be released October 10 via Nuclear Blast Records. Both performances included the CNSO Symphony Orchestra. Physical and digital pre-orders are open now. Along with the announcement of the upcoming limited edition vinyl single, the band also recently announced a new slate of North American and European live dates. Three North American dates between September 28 and 30 are scheduled in California. Once those dates are done, the band will rest up before heading south of the border for the Tecate Mexico Metal Fest on October 6. From there, the band will head overseas for a handful of European dates, which will eventually be accompanied by additional dates to be announced at a later date. The band’s current live schedule is noted below. 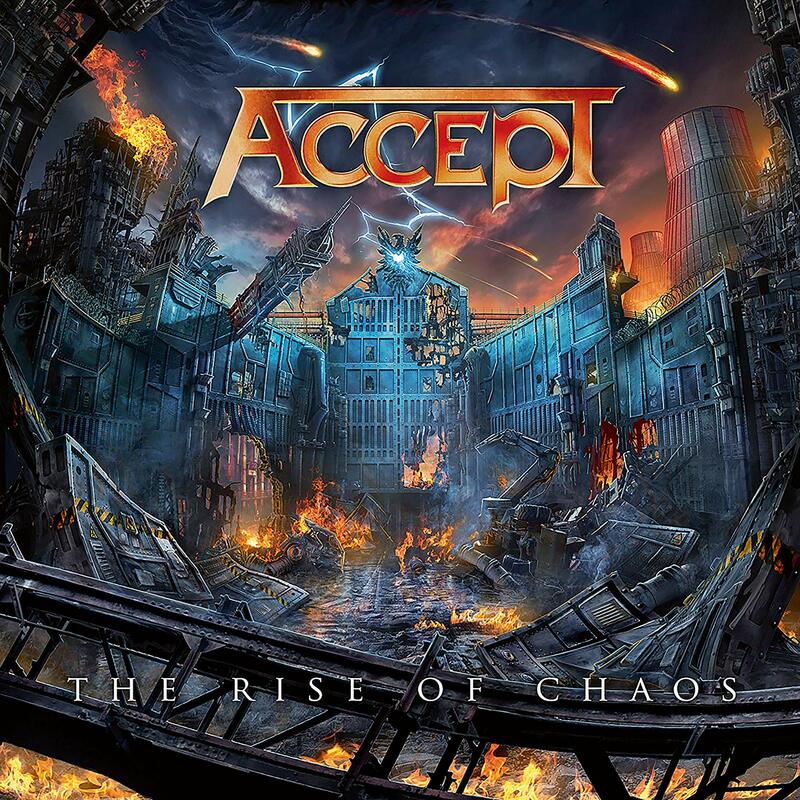 Accept’s upcoming dates will be in support not only of its upcoming live recording, but also its most recent full-length studio recording, The Rise Of Chaos (2017). It is available now in stores and online and can be ordered physically and digitally direct via Nuclear Blast’s online store now. Metal Blade Records had quite a year in 2016, putting out impressive new recordings from Amon Amarth, Wovenwar, Artillery and a number of others. One of the leading labels in the metal community, Metal Blade has wasted little time in 2017 getting things going. It will open the new year late next month with the release of Armored Saint’s new live recording Carpe Noctum. The eight-song, 38-minute recording isn’t necessarily a career-defining collection of songs, but is still impressive in its own right. It is just one of the elements to note in examining the recording’s overall presentation. The band’s stage presence is just as important to note in examining the recording’s presentation as its set list. Considering that the recording will seemingly only be released on CD, its audio mix rounds out its most important elements. Each element is important in its own right. All things considered, Carpe Noctum proves to be a recording that Armored Saint fans new and old alike will appreciate. Armored Saint’s latest live recording Carpe Noctum is a collection of live performances that fans new and old alike will appreciate. The eight-song, 38-minute recording will be released in stores and online Feb. 24 via Metal Blade Records. The main element to be examined in this recording is its set list. The set list takes audiences all the way back to the band’s 1984 debut full-length album March of the Saint and all the way up to the band’s most recent album Win Hands Down (2015). Along the way, three more of the band’s nine total albums are represented here. The albums in question are its 1985 sophomore record Delirious Nomad, its 1991 album Symbol of Salvation and its 2010 record La Raza. 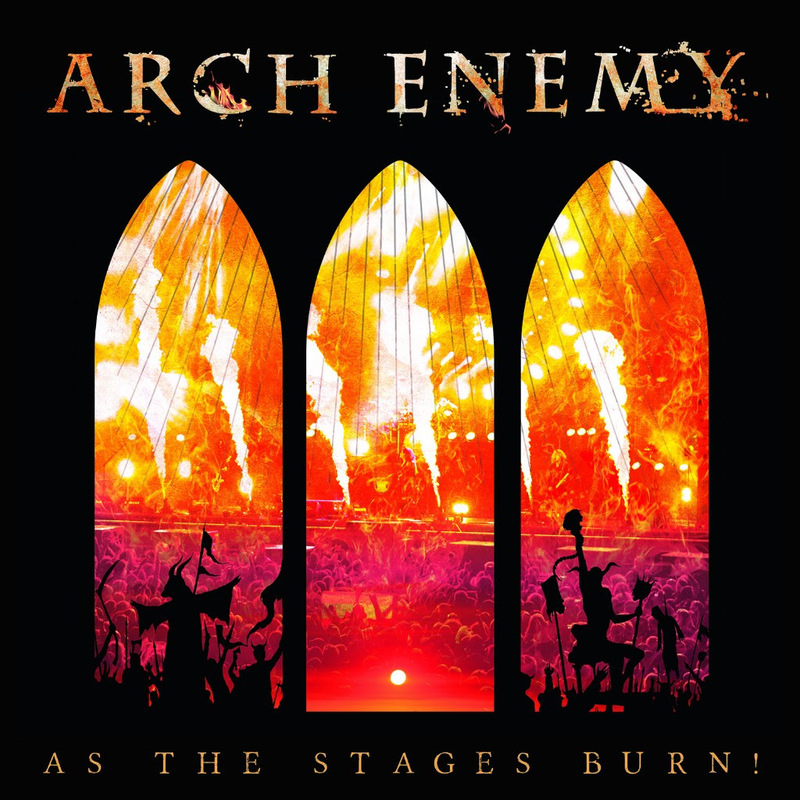 According to Metal Blade Records’ summary description of the set list, it appears the set list was pulled from Armored Saint’s set at the 2015 Wacken Open Air Festival and its headlining show at Aschaffenburg, Germany. In other words, the set list presented here is not one complete concert, but seemingly a collection of performances from two separate concerts. That would likely account for why the recording features such a limited number of songs in its defense. This is a good thing in its own right, too. That is because it provides audiences a more diverse representation of the band’s live show. Again, fans new and old alike will appreciate this aspect of the recording. Carpe Noctum’s 8-song, 38-minute set list is an important piece of the recording’s overall presentation. That is because while not necessarily career-defining, it does at least present some highlights from the band’s extensive span of records. It also provides audiences a relatively diverse representation of the band’s live show. That is because it allegedly pulls from not one but two of the band’s live shows. While the recording’s set list is clearly an important piece of its whole, it is only one of the pieces of the recording that should be considered in examining the recording’s overall presentation. The band’s performance of said songs is just as important to note as the songs themselves. Audiences will note in taking in these performances that the band’s members largely let their performances do the talking for them. Since this recording is only available on CD, it is difficult to know if the songs presented here were presented in the same order as in the original performances. There could have been some interaction with the audience between songs at those performances. Again, that can’t be determined here. That aside, the band members’ performances do plenty to keep listeners’ engaged. Front man John Bush commands the stage with each performance, his pipes in prime condition. Drummer Gonzo Sandoval keeps the band moving in each song with his solid time keeping. The dual guitar approach of Phil Sandoval and Jeff Duncan adds even more depth to the band’s stage presence. Of course one would be remiss to ignore bassist Joey Vera’s work on the low end. Each band member’s performance in itself plays its own critical part to the whole of the performances. They cut through solidly throughout the recording, too. Altogether, the band members’ performances prove to be just as enjoyable here as the concert’s set list itself. One can’t help but hope Metal Blade Records will release the concert on DVD and/or Blu-ray, though. One would be safe assuming those performances would hold even more significance when able to be seen and heard, and not just heard. Even with that in mind, the band’s overall performances throughout the recording still proves to be just as important to the recording’s presentation as the sets’ featured songs. While the band members’ performances prove to be just as important to the recording’s presentation as the recording’s featured set list, neither element would be worth discussing without mention of the concert’s audio mix. The set list at the center of Armored Saint’s new live recording and the band’s performance thereof are both key pieces of the recording’s overall presentation. That has already been discussed. They are only a pair of the recording’s most important elements. Its audio mix forms the recording’s foundation, especially considering that the recording is currently available only on CD. Those responsible for the recording’s audio mix are to be given their due credit here. That is because they expertly handled the situation presented in each setting. The Wacken performances were open, outdoor performances. This critic can’t say for certain if the band’s other featured performance was outdoor, too. That aside, those behind the recording’s audio engineering expertly balanced each musician’s part. No one part overpowered the others at any point throughout the recording. What’s more, inside or out, audiences aren’t left feeling like they’re listening to a bootleg recording, either. Believe it or not, there are some “professional” live recordings out there that do in fact sound more like bootlegs than professional recordings. This recording is not in that category. To that end, the balance of that element and the balance of the musicians’ own parts in each song proves the importance of the recording’s audio mix to its whole, too. When that element is set alongside the concert’s set list and the band members’ equally entertaining performances, the whole of the recording proves to be a collection of live performances that Armored Saint fans old and new alike will appreciate. The countdown is officially on. 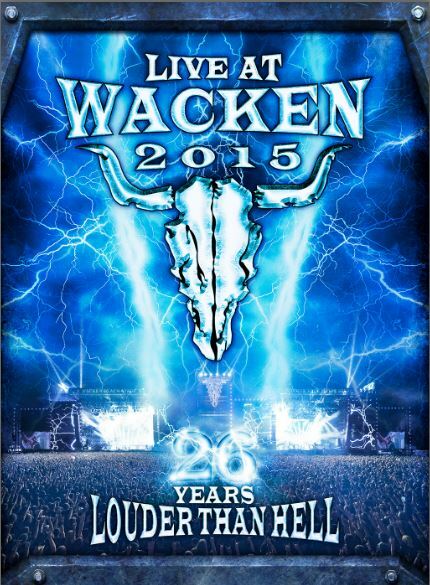 The 2016 Wacken Open Air Festival is now less than a month away. Now in its 26th year, the festival, billed as the world’s biggest Metal Festival, will return to its namesake town from August 4th – 6th. And just in time for the festival’s return, UDR Music has announced a very special collection of performances from the 2015 edition of the festival. Live at Wacken 2015 – 26 Years Louder Than Hell will be released Friday, August 26th, 2016. It will be released on two separate combo packs, the first of which will be a four-disc 2 CD/2 DVD combo pack. The other is a 2 BD/ 2 CD combo pack. The set lists presented in each platform differ slightly from one to the next in terms of their sequencing but are still very etensive. They include performances from Judas Priest, In Flames, Sabaton, Danko Jones, Biohazard, Uli Jon Roth, and many others. The total run time for the compilation is 261 minutes (or four hours and twenty-one minutes). The full track listing for each platform is noted below. Veteran hard rock band Armored Saint’s latest full-length LP Win Hands Down is a rather aptly titled release. That is because the recently released album does indeed win hands down. That is obvious from the album’s full throttle hard rock anthem of an opener to the more socially conscious commentary of ‘That Was Then, Way Back Then,’ to the old school hard rock throwback that closes out the album in ‘Up Yours,’ Every one of the tracks on this record show in their own way what makes this seventh full-length release from Armored Saint some of its best work to date and one of the best of this year’s hard rock and metal field. Win Hands Down proves from beginning to end in its latest full-length release that the almost hour-long album is one of the best of this year’s hard rock and metal field. From beginning to end, the band keeps hard rock and metal purists with a brand of rock that seemed all but extinct nowadays. That is made clear right from the album’s full throttle opener and title track. Both lyrically and musically, this song shows itself to be a pure throwback to everything that once made hard rock and metal great. The driving dual guitar attack of Jeff Duncan and Phil Sandoval coupled with drummer Gonzo Sandoval’s equally solid, up-tempo time keeping in this song instantly conjures thoughts of Judas Priest, Iron Maiden, and so many other legendary acts of that ilk. Front man John Bush adds even more to that with his powerhouse vocals as he sings, “This is an ode to all my old buddies/The ones that helped me realize when s*** was funny/Cut our teeth/A kick in the a**/Tackling life there’s just one chance/Mischief makers p*** some off/Deal with consequences or not/Roaming the city/Eyes open wide/Every adversary is urged to hide.” Not only does Bush actually sing his way through the verse (and the rest of the album’s songs), but he also makes no bones about the song’s subject material. The song is a tribute to his old childhood friends and those of his band mates. That is made even clearer as he sings in the song’s second verse, “Like some royal decree/A verbal contract/You’re with me/And man I got your back/Seeking adventure every which way/Knowing full well there may be hell to pay/Adolescence in full swing/A booming voice we’re gonna bring/So much that this platoon can do/Bread and circus is the rule.” The line in which Bush notes “Adolescence in full swing” makes the strongest argument about the song’s topic. Coupled with the rest of the song’s lyrical content, audiences get a picture of a group of friends simply going out and enjoying life and all that it brings good or bad. Such a concept seems rare in today’s hard rock and metal communities. Because it seems to be so rare, it makes the combination of the song’s lyrics and its now almost celebratory musical content a whole that proves to be one of the best hard rock anthems to come along in a long time. ‘Win Hands Down’ is one of the best hard rock anthems to come along in a very long time. Being the opening track to Armored Saint’s new album, it is also a clear example of what makes the band’s latest full-length effort one of the best of this year’s new hard rock and metal records. The record’s seemingly socially conscious midpoint ‘That Was Then, Way Back Then’ is another example of what makes Win Hands Down work so well. Much as with the album’s opener this song also can be argued to be another throwback to a great era of rock. The argument is supported through the song’s musical content. Yet again, Bush actually sings his way through the song. Even better, audiences can actually understand what Bush is saying as he makes his way through the song. On a related note, Bush’s band mates give the song a certain attitude for lack of better wording thanks to their combined talents. This is very important when taking note of the song’s lyrical content. The lyrical content in question comes across, as previously noted, as a social commentary of sorts with Bush singing, “I drift on back a couple of decades/And regress to a time when I was king/The future seems so uncertain/But the past is a place I could do anything/Give me a phone call/Send me a text/I even gave you/Your own unique ring. This verse within itself paints a damning picture of someone that is extremely full of himself or herself and who would much rather live in the past than the present. This argument is solidified even more as Bush sings in the song’s opening verse, “I’m taking a walk to the neighborhood psychic/Want to find out what’s in store for the day/Got all my pictures strewn across Facebook/Want to be liked in a desperate way/I market myself/It’s a foregone conclusion/I dish out winks in this busy foray.” Yet again, Bush paints a picture of someone that seems to be entirely wrapped up in his or her own self-importance. Everyone out there knows someone just like the figure portrayed here. The musical content exhibited in the song accents the mindset of said person expertly with its tone and its energy. Both elements combined, they show exactly why this song is yet another impressive addition to a record that is, once again, one of the band’s best records to date and one of the best of this year’s hard rock and metal field. 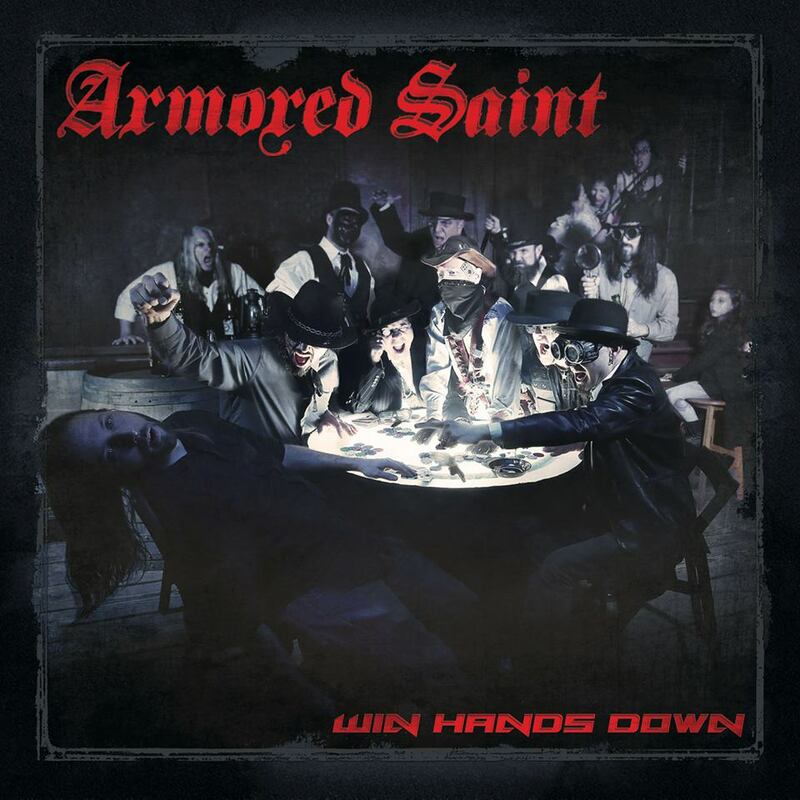 ‘Win Hands Down’ and ‘That Was Then, Way Back When’ are both prime examples of why audiences new and old alike will enjoy Armored Saint’s latest full-length effort. While they both serve as excellent examples of what makes Win Hands Down such a solid record, they are hardly the only positives exhibited in this record. The album’s closer ‘Up Yours’ puts the exclamation point on the statement made throughout the album’s nearly hour-long run time. In terms of its musical content, the song’s tone and its energy does an impressive job of illustrating the thought patter and tension in the song’s speaker. Bush adds to that depth with his own vocal delivery style as he sings, “Seems to be a delusion of grandeur/A twisted f***ed up matter/A distorted sense of wrong and right/And that aint right/Got your app with the police scanner/Mapped out daily planner/And the krav maga trainer in case of a fight.” This verse alone paints quite the picture. It paints a picture of someone who perhaps isn’t necessarily firing on all eight cylinders. That argument is strengthened as he sings earlier in the song, “A stroll in the park can be a moment of zen/But you lurking in the dark/Begging to be my friend/Can really rub/Rub me the wrong way/Following my tracks is what you do/Although I never remember ever giving a clue/Or a hint or a blatant come with me.” This verse makes the picture of the subject’s object of hatred even richer. It reveals that person to be someone that is quite gone for lack of better wording. Bush’s speaker here is going after that person, letting him or her know in no uncertain terms just how messed up in the head he or she is. Again, the musical side of this song puts the finishing touch on that statement. Both elements together make ‘Up Yours’ just as perfect of a closer as the album’s title track is as an opening number. It puts the final touch on the statement that, as already noted earlier, Win Hands Down Wins Hands Down. Whether for this song,the album’s opener, its seemingly socially conscious midpoint, or for any of the remaining half-dozen tracks that round out the record, all nine tracks together make Win Hands Down one of the best of this year’s hard rock and metal field. Fans can pick up Win Hands Down in stores and online now via Metal Blade’s online store at http://www.indiemerch.com/metalbladerecords/search/?q=Armored+Saint+Win+Hands+Down. To keep up with the latest sports and entertainment reviews and news, go online to http://www.facebook.com/philspicks and “Like” it. Fans can always keep up with the latest sports and entertainment reviews and news in the Phil’s Picks blog at https://philspicks.wordpress.com.